I’ve been meaning to write this review for a few days now, but the free time where I could have written the post have actually been spent reading and going back over the book. This is probably a hint of where the review is going. Underwater Angling is fantastic! Paul and Stuart have a passion for what they do, and it is clearly demonstrated throughout the book. After flicking through the pages when it arrived, my first impressions were high. There are some really great pictures of fish and rigs. The underwater images are really interesting. I’m sure we have all tried to picture what our rigs look like after we have cast a bait into the water, seeing these in real life offers a fantastic insight. I have often thought my feeder fishing has suffered due to my hook bait not sitting close enough to the feeder offerings – I’ve certainly got more information now which should help me catch more fish! The scientific approach the book takes is for me what sets it apart from other books or articles in magazines. I have read lots of articles which tend to be along the lines of “I did this and I caught these fish”. 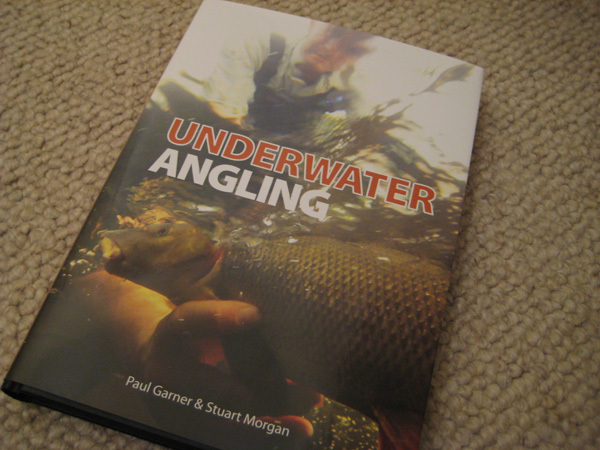 This can be good as it does offer advice on which methods are producing fish. However, Underwater Angling questions traditional approaches and offers suggestions on what could improve bait presentation or where to fish by investigating what happens below the surface of the water. There are lots of examples where the authors had moments where what they found was the opposite to what they assumed would happen. I’m not going to list these out – read the book! So far, I found a few of the chapters particularly interesting. With Barbel fishing I have spent a lot of sessions experimenting with different braids, different hook patterns, and different lengths of hook lengths. The findings in the book will save hours of experimenting on the backside and will definitely help me make decisions next time I’m out on the bank. This entry was posted in Reviews by info@looksfishy.co.uk. Bookmark the permalink.